BELIZE CITY, Wed. Feb. 4, 2015–Miriam Serrut, Registrar of Pesticides at the Pesticide Control Board, informed Amandala today that in a meeting with colleagues of the Department of the Environment, they had agreed to prioritize a review of the neonicotinide class of insecticides, which some scientists say have caused adverse effects on bee colonies, with a view to looking at what mitigation measures may be needed to combat any adverse effects that may have resulted. Serrut confirmed, after we named some examples cited in the international press – thiamethoxam, clothianidin and imidacloprid, said by the European Food Safety Authority (EFSA) to pose an unacceptable risk to bees – that some of these pesticides are still registered for use in Belize. 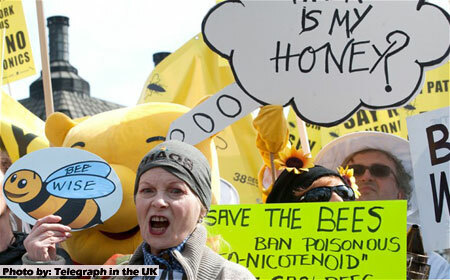 It had been reported in January that although the EU had banned the use of neonicotinides back in 2013 (see international article, “Bee-harming pesticides banned in Europe”, appearing on page 41 of this issue), farmers had resorted to using older chemicals, including some against which some bugs had built resistance. The news reports say that as a result, the rapeseed harvest this year is expected to suffer a decline of 15%. Serrut said that there is a lot of data to confirm the adverse effects of the insecticides on bees, although, as is often the case with such studies, there are also those which refute them. She explained that beekeepers in the western district of Cayo are not at risk, since they mostly have their apiaries in the Chiquibul Forest, far removed from agricultural lands which use the insecticides, but in northern Belize, where farms such as papaya farms use those pesticides, there are apiaries which lie in closer proximity. Still, there is a lack of scientific data specific to Belize, and no published data to indicate what, if any, impacts have been suffered by the country’s honey producers. However, any negative impacts would be even more far-reaching, since bees are also vital for the cross-pollination of certain flowering plants, including fruit trees. Serrut said that the neonicotinide review will be undertaken by the Registration Committee, a subgroup of the board, and led by environmental officer Leonides Sosa, who sits on the board for the Department of the Environment. She told us that the review schedule will be made public to allow input by civil society as part of the consultation process.